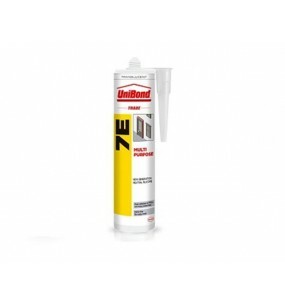 This Unibond 7E is a new formulation low modulus neutral cure silicone perimeter sealant from Henkel. It combines the advantages of excellent primerless adhesion properties and neutrality. It can be applied on numerous substances such as glass, ceramics, polished and unpolished aluminium, rigid PVC, wood, concrete and stainless steel. Once it has cured LMN has a good resistance against conventional cleaning products and some chemicals. This Unibond 7E is a new formulation low modulus neutral cure silicone perimeter sealant from Henkel. It combines the advantages of excellent primerless adhesion properties and neutrality. It can be applied on numerous substances such as glass, ceramics, polished and unpolished aluminium, rigid PVC, wood, concrete and stainless steel. Once it has cured LMN has a good resistance against conventional cleaning products and some chemicals. Perfect for adhering fascias and soffit trims.